Stay safe and injury free with this fantastic Retro Rockets design safety helmet from Micro Scooters. The helmet is perfect for use with a scooter or bike. It has extra padding, air vents, secure adjustable straps, clip fastening and a spin dial interior band that adjusts to fit the wearer's head. For heads with a circumference of 48-52cm choose a small helmet and for heads sized 53-57cm choose medium. 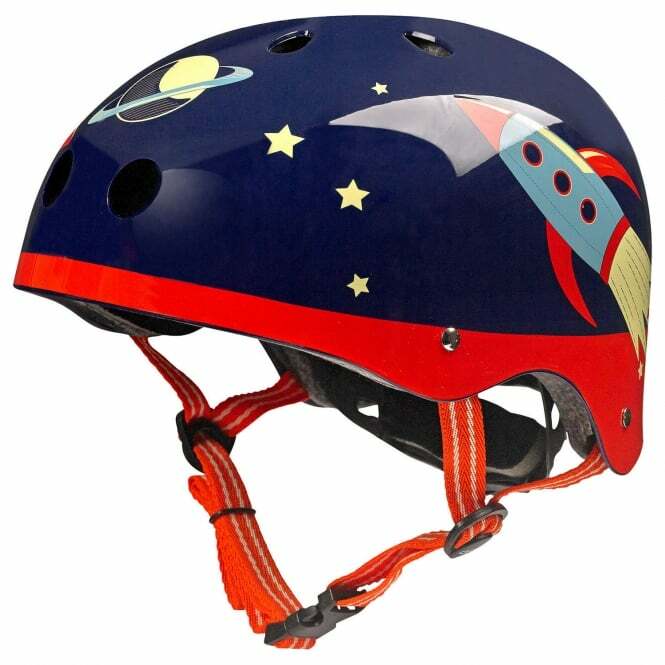 The Retro Rockets helmet is dark blue with an out of this world rockets, stars and planets design. Check out the entire range of Retro Rockets scooter accessories to customise your scooter and make it stand out from the crowd.